The Governors of Georgia, Texas, Arkansas, Delaware, Maryland, New Mexico, and North Carolina have petitioned EPA Administrator Lisa Jackson to waive the mandatory ethanol blending requirements established by the Renewable Fuel Standard (RFS). The petitioners hope thereby to lower and stabilize corn prices, which recently hit record highs as the worst drought in 50 years destroyed one-sixth of the U.S. corn crop. Corn is the principal feedstock used in ethanol production. Virtually all of Arkansas is suffering from severe, extreme, or exceptional drought conditions. The declining outlook for this year’s corn crop and accelerating prices for corn and other grains are having a severe economic impact on the State, particularly on our poultry and cattle sectors. While the drought may have triggered the price spike in corn, an underlying cause is the federal policy mandating ever-increasing amounts corn for fuel. Because of this policy, ethanol production now consumes approximately 40 percent of the U.S. corn crop, and the cost of corn for use in food production has increased by 193 percent since 2005 [the year before the RFS took effect]. Put simply, ethanol policies have created significantly higher corn prices, tighter supplies, and increased volatility. Agriculture is the backbone of Arkansas’s economy, accounting for nearly one-quarter of our economic activity. Broilers, turkeys, and cattle — sectors particularly vulnerable to this corn crisis — represent nearly half of Arkansas’s farm marketing receipts. Arkansas poultry operators are trying to cope with grain cost increases and cattle familes are struggling to feed their herds. Section 211(o)(7) of the Clean Air Act (CAA) authorizes the EPA to waive all or part of the RFS blending targets for one year if the Administrator determines, after public notice and an opportunity for public comment, that implementation of those requirements would “severely harm” the economy of a State, a region, or the United States. Only once before has a governor requested an RFS waiver. When corn prices soared in 2008, Gov. Rick Perry of Texas requested that the EPA waive 50% of the mandate for the production of corn ethanol. Perry, writing in April 2008, noted that corn prices were up 138% globally since 2005. He estimated that rising corn prices had imposed a net loss on the State’s economy of $1.17 billion in 2007 and potentially could impose a net loss of $3.59 billion in 2008. At particular risk were the family ranches that made up two-thirds of State’s 149,000 cattle producers. 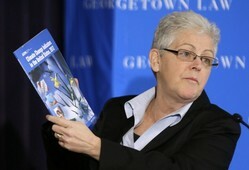 Bush EPA Administrator Stephen Johnson rejected Perry’s petition in August 2008.